The strong stock market gains a week ago set the stage for the market’s resilient performance last week. After the long weekend, stocks opened under pressure on Tuesday, which I had predicted based on the previous week’s excess bullishness. The S&P 500 was down almost 2% on Tuesday, but closed well above the lows. It continued to move higher, and with Friday’s strong gains just finished only a bit lower for the week. The Dow Industrials and Russell 2000 managed to close the week barely higher along with the Dow Utilities. The Dow Jones Transportation Average was down 0.90% for the week while the Nasdaq 100 was just barely lower. With the market’s close on January 18 there was significant improvement in the market internals, as the advance/decline lines had moved through significant resistance. This signaled a positive intermediate-term trend and was a sign that future market declines should be a buying opportunity. The market internals were slightly positive last week. Even though the Spyder Trust (SPY) was a bit lower for the week, the S&P 500 A/D line edged a bit higher. It has now moved further above the downtrend (line b), confirming the bullish outlook. Once the SPY overcomes the weekly high at $266.98, the 61.8% resistance at $269.46 is the next target, with strong chart resistance at $277.44 (line a). This level is 4.4% above Friday’s close, but many bear market advocates are waiting for a move above $280 before they change their tune. A daily close below last week’s low at $260.66 would be a sign of weakness. It has also been a positive sign that all of the other major market tracking ETF's—Invesco QQQ Trust (QQQ), iShares Russell 2000 (IWM) and SPDR Dow Jones Industrial Average (DIA)—have closed above their quarterly pivots (QPivot). The QPivot is a resistance and support level derived from the prior quarter's high, low, and closing price. All of these ETF's had a weekly close below their QPivots in early October, foreshadowing some of Q4's poor performance. This table provides the QPivots for the Quarter 1, which should be monitored. A weekly close below these levels would be a reason for concern, as this level often acts as support. The QQQ had a low last week of $160.32, while the IWM reached a low of $143.46 before it turned higher. The Invesco QQQ Trust (QQQ) closed barely above its flat 20-week EMA last week and just a few cents below the 50% retracement resistance at $165.26. The more important 61.8% resistance level stands at $170.39, and a close above this level would be a positive sign. The weekly Nasdaq 100 advance/decline line has also moved well above its downtrend (line a) and the November high. The daily Nasdaq 100 A/D line (not shown) is also well above its WMA and rising strongly. The economic calendar is full this week, as several reports had been delayed by the government shutdown. Some of the highlights are the Chicago Fed National Activity Index on Monday, Consumer Confidence on Tuesday, and GDP on Wednesday, with the monthly jobs report and the ISM Manufacturing Index on Friday. Of course, the FOMC Meeting begins on Tuesday with their announcement on Wednesday. The very busy earnings calendar is likely to have even a greater impact on the financial markets, as Apple (AAPL), Tesla (TSLA), and Amazon (AMZN) all report this week. Last week the April Comex Gold futures closed at $1304.2, which was a gain for the week of 1.2%. This was the first close above this level since June 2018. The next major resistance (line a) is at 1341.30, which is just above the weekly starc+ band at $1334.4. The weekly on-balance-volume (OBV) has just broken its downtrend (line b) following the move above its WMA in early October. 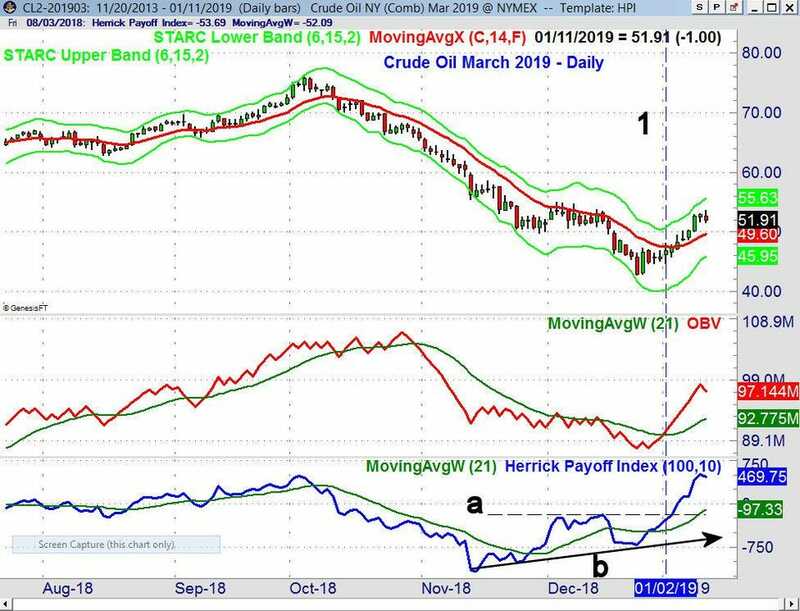 The Herrick Payoff Index (HPI), which correctly identified the low in crude oil earlier this month (see chart), turned positive for gold in September as it moved above its WMA and the downtrend (line c). It has now moved further above the zero line, indicating the money flow is still clearly positive. There are a number of ETF's that are still outperforming the S&P 500, and they should be better cushioned against individual stock's earnings risk and therefore are favored for new investments. New stock purchases should be limited to those not expecting an imminent earnings report in the next week or so.